Later this month, South Korean President Moon Jae-in will meet North Korean leader Kim Jong-un. This is the third inter-Korean summit since the days of the Sunshine Policy – an approach of open dialogue with North Korea from 1998 to 2008. That effort earned a Nobel Peace Prize, but previous liberal governments in South Korea struggled to achieve real success. The Sunshine Policy drew widespread complaints, from the right especially, that it was all South Korean concessions in exchange for nothing but a halt to provocations. North Korea merely gave up its willingness to attack South Korea, and was rewarded with US$3–4 billion over a decade. 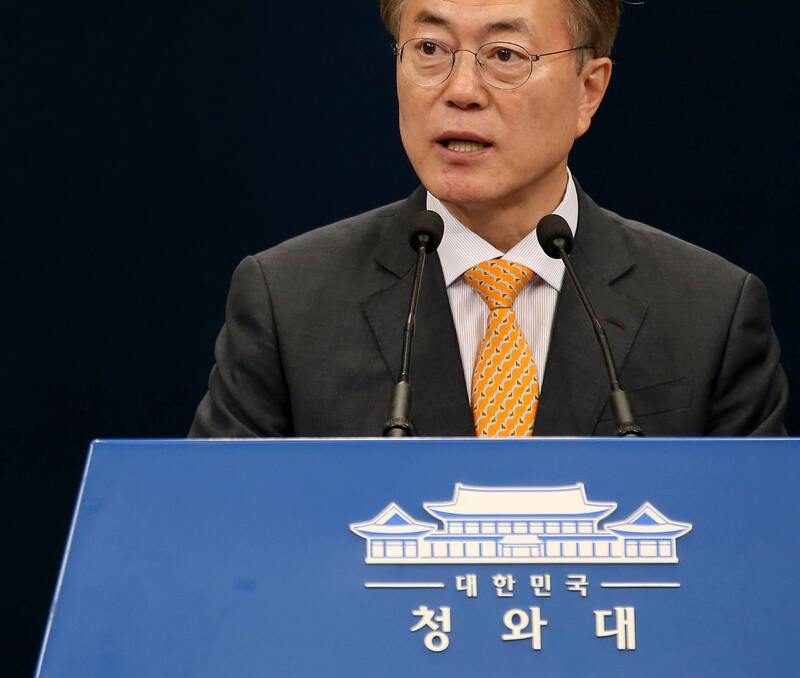 Overcoming this conservative scepticism at home will be Moon’s biggest hurdle. He won with only 41% of the vote. Moon is a minoritarian president, and whatever deal he brings home will be dissected in the conservative press. He will likely be compared to Neville Chamberlain and “peace in our time”. Unfortunately, Moon has not floated any proposals or talking points, so we can only guess what he might focus on or give away, but here are some suggestions to run by the hawks. 1. Do not get derailed by North Korean efforts to change the subject from its nuclear and missile programs. Perhaps at the heart of scepticism from analysts everywhere about these summits are doubts North Korea would ever give up its nuclear program given 40 years of effort to build these weapons, and the obvious deterrent utility – no American-led regime change is possible now – of keeping them. It is easy to predict that Kim will seek to discuss anything and everything but the nuclear missile program. There will be lots of suggestions for joint projects, such as sports teams at international games, economic cooperation, rail through North Korea, training of North Korean technical staff, family reunions, and so on. And lots and lots of nationalism, with the subtle dig that America stands between the two Koreas. Moon must nevertheless hook any movement on these pleasantries to some kind of controls on the nuclear missile program. 2. If the North Koreans will not discuss denuclearisation, try nuclear safety. I have floated this idea for the last month or so because of the likelihood that the North will balk on denuclearisation and possibly walk out. Our goal, however unlikely, is CVID: complete, verifiable, irreversible disarmament. The North Koreans will likely not move much on that, if at all. Or they will ask for a concession so outrageous – the end of the US–South Korean alliance, for example – that Moon will have no choice but to say no. (Moon himself might be open to such a swap, as the Lowy Institute’s own Sam Roggeveen has floated, but I doubt 41% Moon could get that past the right back home.) Indeed, John Bolton may be hoping for exactly this outcome: Moon demands CVID; the North Koreans laugh and walk out; and the Americans have their casus belli. An alternative that keeps the discussion in the nuclear space, and avoids the subject-changing problem mentioned above, is nuclear and missile safety. North Korea, besides being an Orwellian tyranny, is also a grossly mismanaged semi-feudal state. One can only imagine how sloppy and careless it is with nuclear materials. We already know their main test site suffered a tunnel collapse which killed 200 people. So why not talk with them about issues such as waste disposal, storage, site access, missile command and control, and so on, to avoid a Chernobyl-style meltdown? That is a legitimate concern, one North Korea (and China) probably share, and keeps the conversation focused on the nuclear program. 3. Map out a Trump–Kim summit as thoroughly as possible. The possible May summit between Kim and US President Donald Trump is an enormous risk for the democratic camp. I have argued vociferously in print, on Twitter, and on TV for weeks that it should be cancelled. Trump has neither the knowledge of Korea, the willingness to learn (read) about it, the attention span, nor the clear preference for democracy over dictatorship needed to negotiate on behalf of democracy with a tyrant he may well secretly admire, as he does so many other dictators. I am amazed that the Moon government thinks it is a good idea to put someone like Trump in a room with their existential competition. Were it up to me, I would cancel the summit immediately. But if Moon insists, then he should do his very best to nail down specific items and issues for that discussion. Naturally Kim and Trump, fellow norm-breakers, will violate those guidelines. So Moon should broadcast them very publicly so that Trump faces a public backlash if he veers wildly from the script. It is easy to see Trump gambling away South Korean security for some small-beer outcome which he can market as a “win” back home to change the subject from his endless scandals so that the Republicans survive this fall’s midterm elections and he avoids impeachment next year. It should be pretty obvious to everyone now that Trump makes decisions based on his narrow interest; he is certainly not thinking about the American national interest, much less that of a small ally. Deals with North Korea in the past have collapsed over sequencing, implementation wiggle room, delays, and other such deep-in-the-weeds specifics. Moon should try his mightiest to confirm specific moves and timetables. US officials used to complain of “buying the same horse twice” from the North. After 25 years of negotiating with North Korea on nukes, it should be clear to everyone that they are canny negotiators who will take a mile if you give them an inch. This is does not mean Moon should negotiate in bad faith. Democracies should not do that; that is one of things that makes democracy morally superior to regimes such as North Korea. But there should be enormous scepticism. A big-bang deal – swapping US troops for nukes is the most obvious – is a huge risk. Go slow. Get the North Koreans to agree to some mid-level proposals which can be overseen in some detail, and then let’s see if they actually stick to them. There is little strategic trust between North Korea, South Korea, and the US. Moon really will be pilloried, as Chamberlain was, if he naively hopes that Kim is not of the same ilk as his family predecessors. Seven years into Kim’s reign there is little to suggest that he is a reformer of any kind. Indeed, the most remarkable part of his rule is just how little North Korea has changed despite the shotgun succession and all the international pressure. The North is still a human rights disaster, still a tyranny, still belligerent, still a trouble-making international rogue, still promoting a cult-like ideology, and still threatening South Korea. And on top of that, it is a nuclear-missile state. These prescriptions are admittedly hawkish. Perhaps too sceptical. But they channel the response Moon will receive if he takes a huge leap later this month. Moon surely sees himself as Nixon going to China, rather than Chamberlain going to Munich. We can always hope, of course. But that is not a strategy, and in the midst of all this year’s pleasant atmospherics, note that North Korea has yet to float one meaningful concession. It’s all just talk so far. Maybe Moon can change 25 years’ of North Korean nuclear history, but I doubt it.